Wow, Today was an incredible day. The only thing missing was you. One of the baseball fields you played on your entire childhood was dedicated and named after you! Although the rain threatened our event, the weather held out long enough! All the teams attended in uniform. 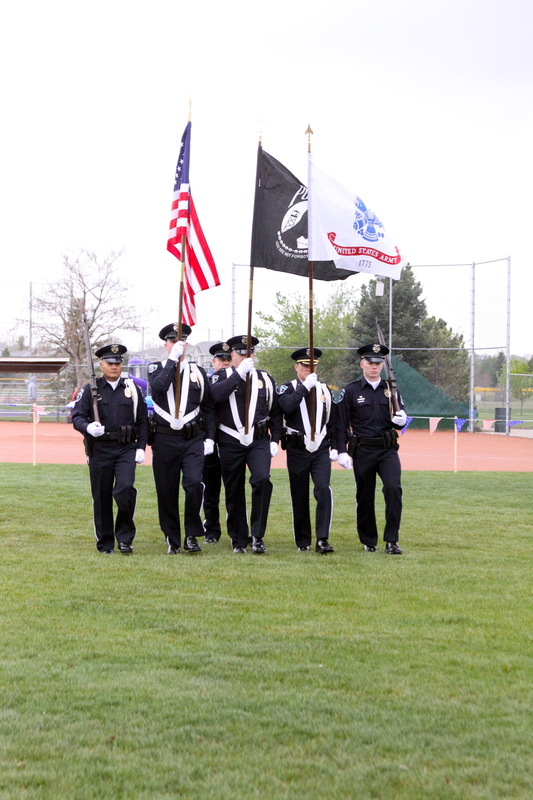 The honor guard was there from the Thornton Police Department. Some were the same men who performed the flag ceremony when your casket was flown from Dover, Delaware to Arvada, Colorado. I thanked them. There was a balloon release for you. 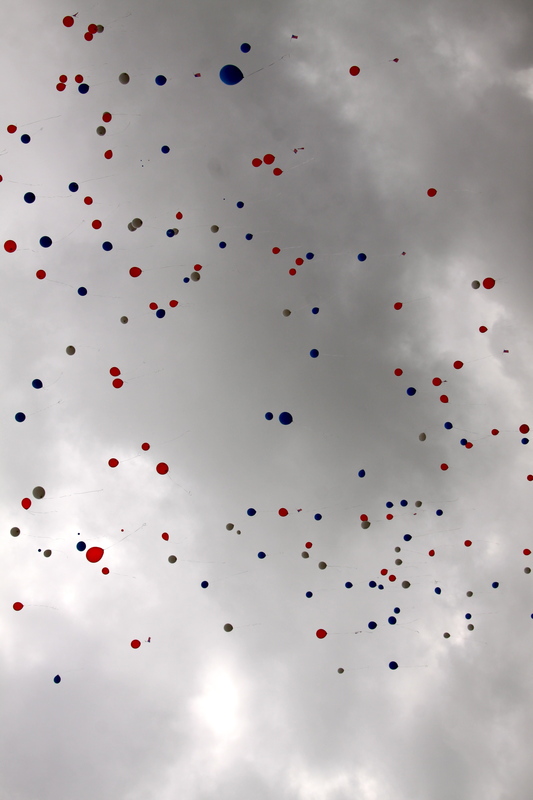 The balloons were red, white and blue, and many of the players tied small American flags to the strings. 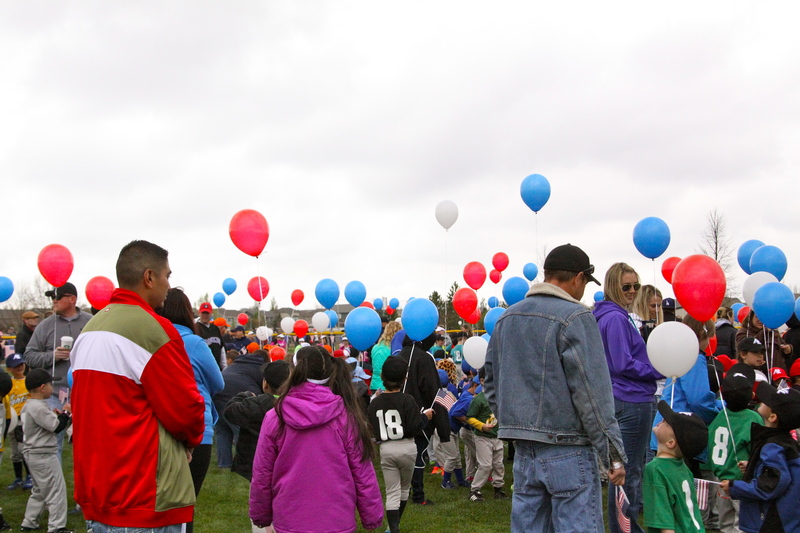 Many wrote words of thanks on their before sending their balloons up to you! Jake was born 07/14/1992 in Louisville, CO. He was raised in Thornton, CO attended Eagle View elementary, Rocky Top middle school and graduated from Horizon, High school in May, 2011. He attended Front Range Community College in 2011 and 2012. Jake’s first love with sports was always baseball. He loved it as a little league player, and a fan. He played baseball his entire childhood. As a young teenager, Jake believed his calling someday was to serve his country, and in May, 2013, he realized that goal by joining the US Army. 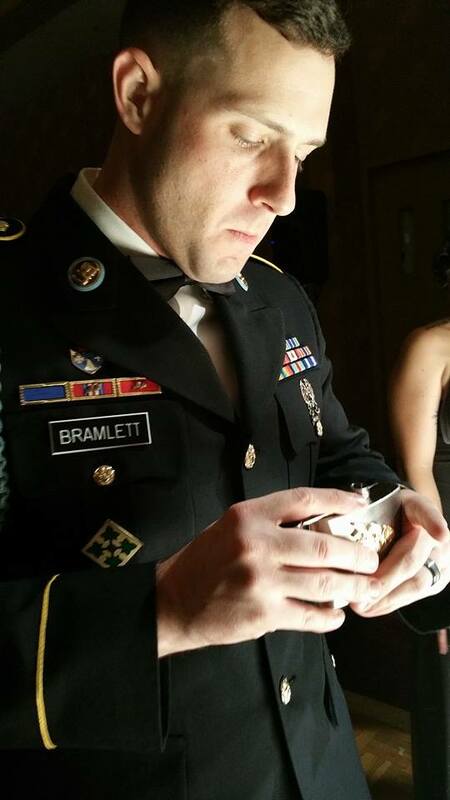 He attended basic training at Fort Benning, GA, and graduated as a proud infantryman in August, 2013, where he was assigned to the 4th Infantry Division at Ft. Carson, CO. 1st Battalion, 12th Infantry, Alpha Company. Because he showed a high level of proficiency and skill as a soldier, Jake was chosen to be one of a select few to join an Arial Reactionary Force to fly on Blackhawks supporting combat missions in Afghanistan. In January, 2013, Jake’s Alpha company was deployed to the Zabul province in Afghanistan, where they joined the “Red Warriors” task force operating out of Forward Operating Base Apache. Since that time, Jake was dispatched on countless chase missions and support operations assisting both NATO forces and Afghan National Security troops in contact engagements and medical emergencies. On May 28, 2014, Jake was dispatched on a medi-evac rescue mission with his squad-mates, and made the ultimate sacrifice, giving his life when his helicopter crashed. 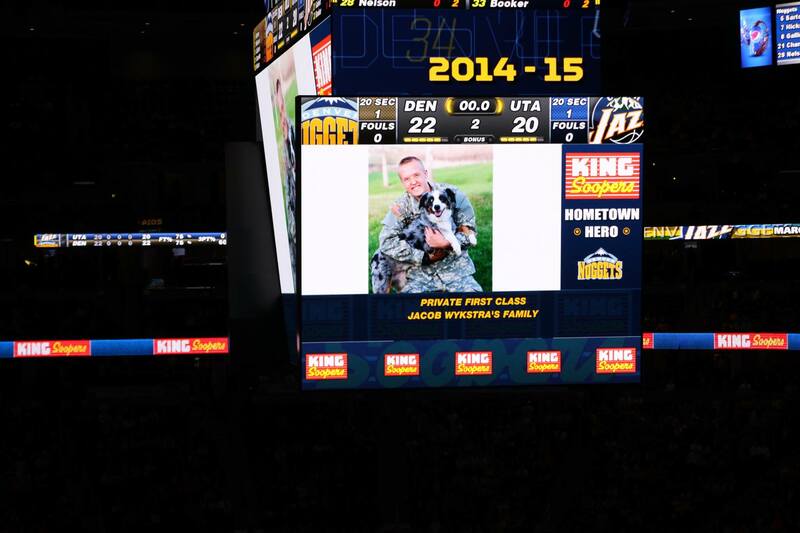 We grieve his loss and thank Jacob for his service and sacrifice. Jake’s infantry Commander in Afghanistan, Lieutenant Colonel William Voorhes said of him……. “Never one to complain, Jake’s smile and presence kept his squad and platoon’s moral high. Also a prankster and practical joker by nature, his sense of humor enabled others to laugh at him, and in turn laugh at themselves in tense and anxious moments. This soldier seemed to defeat fear with his mere presence. A rarity for someone so junior in rank, but very senior in heart and courage. 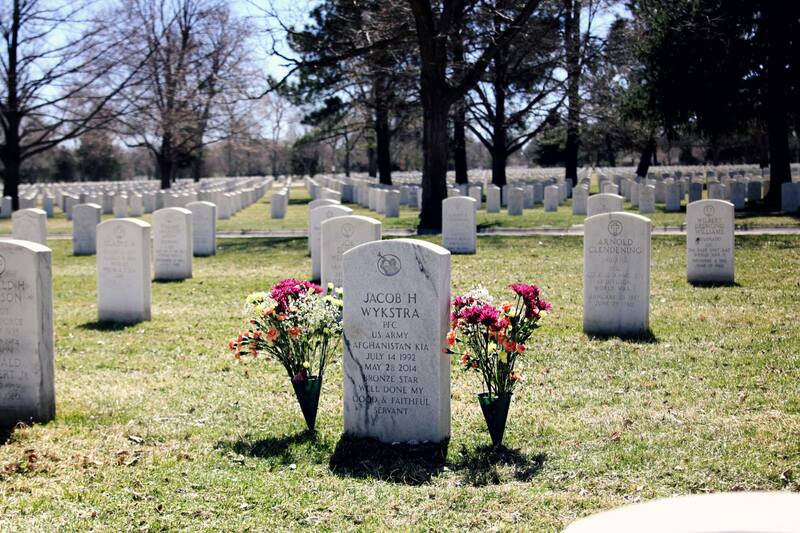 PFC Wykstra was a great soldier, but he was an even better human being. I hold him in the highest regard as a professional soldier, and a person. His service to this nation – exemplary. His training proficiency and aptitude – the top 1%. His potential for future responsibility and leadership – without bounds. His notoriety, attitude, and laughter among his peers – infectious. 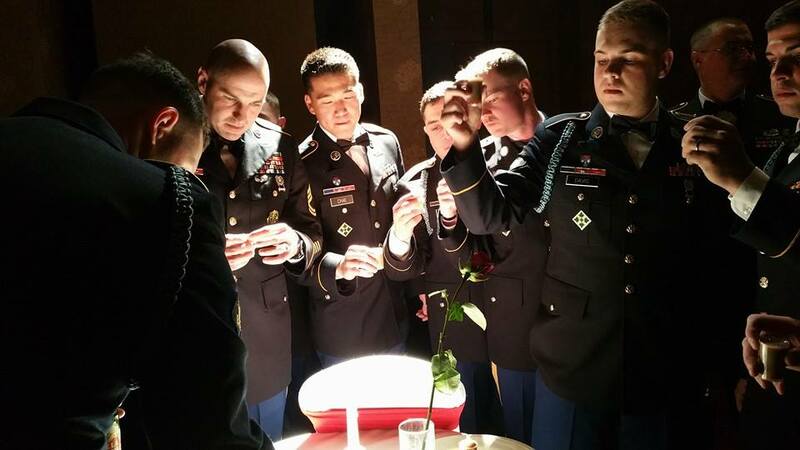 His squad mates loved him – and he them. 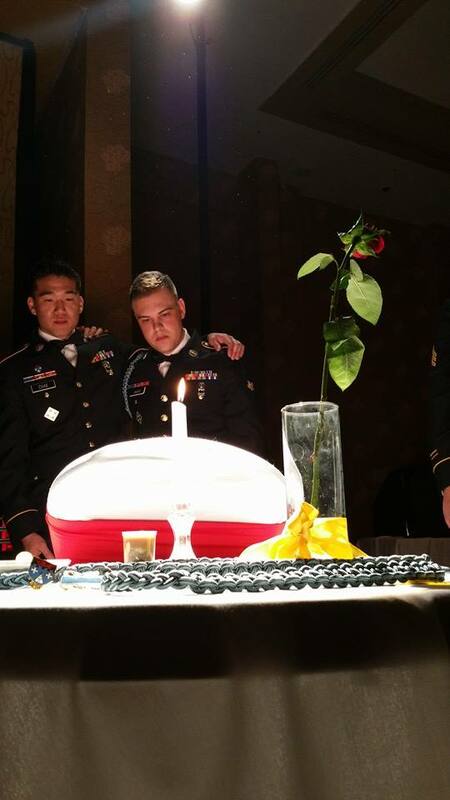 GK Chesterson’s quotation best represents Jake when he said, “The true soldier fights not because he hates what’s in front of him, but because he loves what is behind him”. 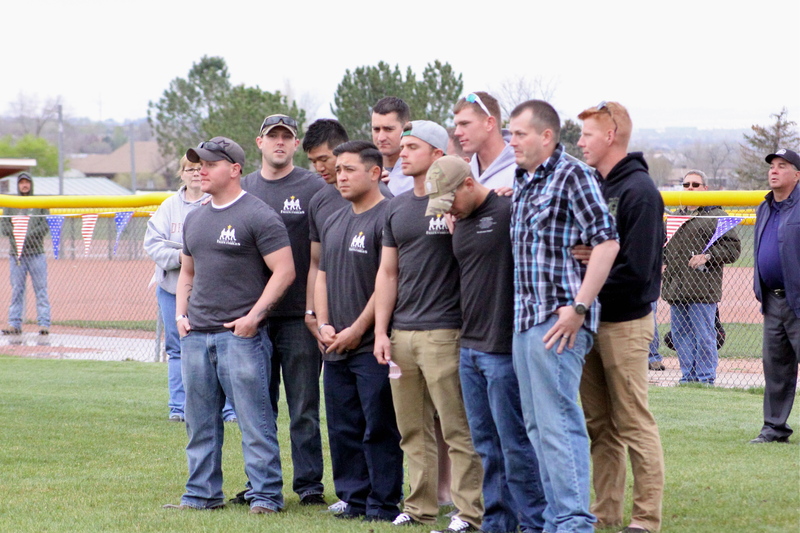 “I want to introduce the wonderful men who were deployed with Jake. These men were his brothers in Afghanistan, they were with him when he was killed, many were wounded and many worked to recover Jake’s body so that he could be returned home to us. 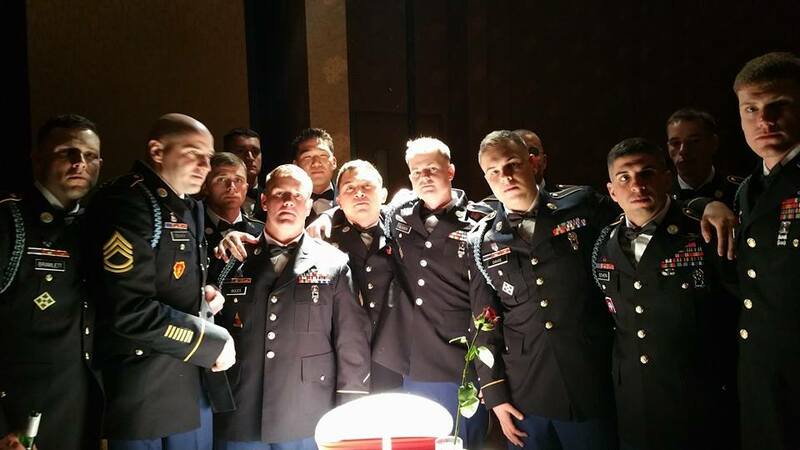 Please join us in thanking them for their courage and willingness to serve our great nation, allowing us our freedom… And we, Jake’s family thank you for the love and friendship you showed him. We love you and will always keep a special place in our hearts and prayers for each one of you. Jake was a great son, husband, brother and friend to many. He loved his family and friends and he had so many friends in his 21 years of life! He was a prankster and had an awesome sense of humor. He loved nothing more than to make people laugh and to raise the spirits of those around him. He was one of those who lived each day to the fullest. “Jake started playing for NLL when he was five years old and continued to play here at these very fields until he played his freshman year at Horizon High School. 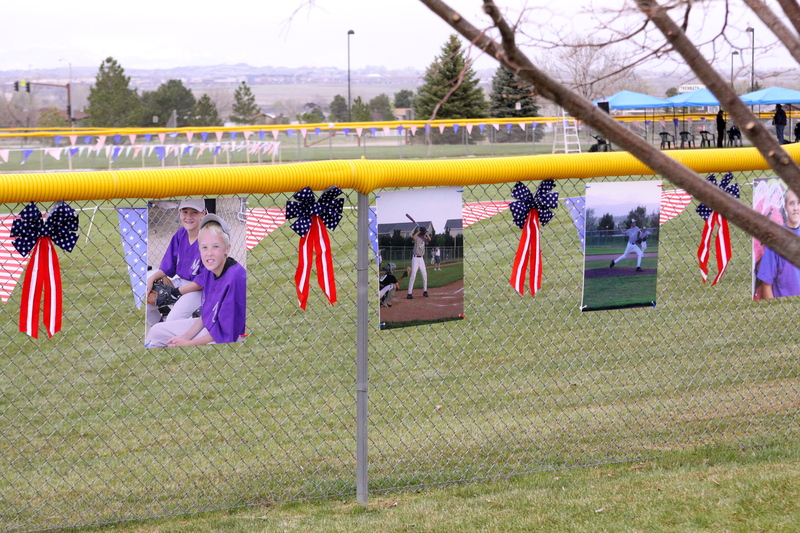 (If you haven’t seen his photos along the fence line, I encourage you to see them on the way out). This organization and the time Jake spent on these fields greatly influenced his life. He made friends here, he learned to accept the wisdom of his coaches, even the rare times when he didn’t agree. He learned about winning and losing and that life isn’t always fair. He learned to work hard to improve himself, to compete and most of all, he learned to have fun! We are so grateful for this organization and the opportunity it gave Jake to learn to fall in love with the great American past time. As parents, we all use bribery to some extent. It’s no secret that schoolwork wasn’t Jake’s favorite thing, especially homework, but if I promised a game of catch after homework, it usually got done. As he got older he often worried that his throwing would hurt my hands, but I happily endured it, because of the fun we had. Jake’s dad spent hours with him, working on his batting and pitching. These special memories will forever be engraved in our hearts because of the joy this sport brought to our precious son. For us, Jake and baseball are synonymous. We rarely received phone calls from Afghanistan, so when we actually got to hear Jake’s voice, we were thrilled. I especially remember the time he called with a bit more excitement than usual. He said, “Hey Mom, we have baseball gloves!” We talked for a bit about who he played catch with and so on, but one part of the conversation especially touched my heart. He said, “When I’m throwing the ball, I feel like I’m back home again. For a short time, it makes me forget about this war.” It seems baseball was a “happy place” for Jake, no matter where he was and for this we are grateful. It was a busy day with lots of laughter, a few tears but mostly smiles! The next day, after church I felt compelled to go back to the field on my own. I sat in your bleachers, as a team practiced on your field. The sights, sounds and smells were all so familiar. I felt as if you were there with me. I think this truly is your place. I can’t wait to go back next month and watch a game on your very own field! I miss you, Buddy. More than you can imagine, but I am trying to do the things that are right so I can be with you again. I love you, Jake. A Battle Fought and Won! My deepest apologies for the misunderstanding regarding the criteria surrounding the memorial plaque. It was never anyone’s intent to cause any additional pain for you, your families, or friends. I have the highest regard for those who serve our country, as my father also served in Korea, and I have always admired those that have sacrificed for all of us. I hope this email will help resolve this issue. First there are two different groups involved with two different memorials. 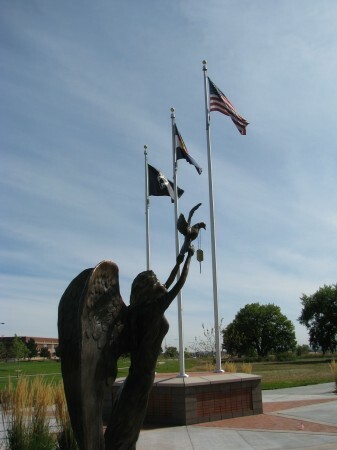 The City of Thornton Memorial which I believe you are aware and is located outside of the Veteran’s Memorial Aquatic Center (VMAC) and is operated by the City of Thornton with assistance from the Thornton Veteran’s Memorial Association. The other is the Fallen Heroes Wall inside the VMAC and is operated by the School District. I understand that Mr. Branaugh was adamant about the criteria of the purple heart however, the district believes that the designations of KIA and MIA should be the criteria for being honored on the Fallen Heroes Wall. We will reach out to Mr. Branaugh and the TMVA so that we are on the same page in the future in regard to the Fallen Heroes Wall. 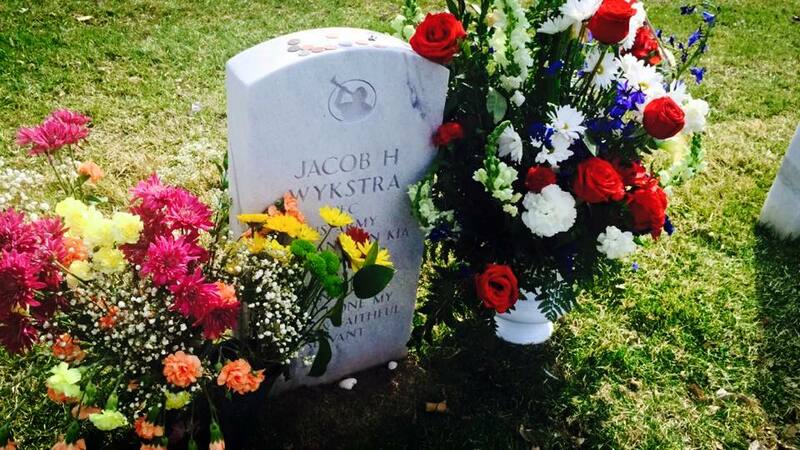 The issue of whether Jake Wykstra will be honored on the Fallen Heroes wall has been confirmed. I spoke with Casualty Officer Sgt. 1st Class Chad DeLouis today. He has confirmed Jake as being KIA. So the district will be honoring Jake with a plaque on the Fallen Heroes Wall within the VMAC. While we do not have a ceremony for the placement of the plaque, we will inform you of when the plaque is placed on the wall. If you would want to have a ceremony to honor Jake the district would be happy to work with you to accommodate an event. If you have any questions on any of the above information please do not hesitate to call me at my office number below. Also my understanding is that the Thornton Veteran’s Memorial Association has procured a brick in honor of Jake to be placed in the Thornton Veterans Memorial. It is also my understanding that the city provides the service to have the bricks placed on their memorial. Similarly the do not host ceremonies for the individuals honored there. Since this memorial is managed by the City I would refer you to them for any additional information about their procedures for the memorial. Once again please accept my apologies for the misunderstandings. My hope is that the plaque in honor of your son Jake will provide the respect he most certainly deserves for his ultimate sacrifice to our country! Jake, There’s a part of me that came back to life during this struggle, and it might sound crazy to some, but I was given the opportunity to advocate for you once again. This is something that parents do, and although it can be a frustrating situation each time, it is a part of parenting. I’ve lost my role as your mom, but this battle gave me the opportunity again if for just a short time. I miss being your mom so much, Jake. I miss helping you as you grow and develop and move through various stages of your life. It was so unfairly brought to an abrupt halt the day you died and I have yet to recover. I fear that I will never recover. But try, I must, so I will continue to fill the hole in my life with service to others in your honor. I will try my best to make you proud of me in this war that I fight daily. I know you are close to our Father in Heaven, so I too will try my best to be close to Him as well. You inspire me to be a better person because of your goodness. You have always been a shining light to everyone who knew you, and for many you remain their inspiration. This is true for me. You are beautiful and I cannot wait until the day when I will see you again. Until then, please know what you mean to me, please stay close to me and please keep lifting others with your smile and good nature. I see KIA here, don’t you? I sit in disbelief and feel completely helpless. Our country, your state and your small town have worked so hard to honor you and as I’ve said before, it’s not over yet. We still have the Little League season opener next week when a field will be named after you. In May we will attend the ceremony adding your name to the granite wall at the entrance of Ft. Carson, listing last year’s casualties. The problem is, I don’t know what will happen after that. Will you still be remembered? You have no descendants to remember you. What happens when we’re all gone? I can’t bear it. This year will end and then what? This week has been especially upsetting. For the first time, a group refuses to honor you. Your school district (the one I taught in for so many years) will not be putting your name on the “Wall of Honor” at the Veteran’s Memorial Aquatic Center because a small Thornton organization is telling us that you are not KIA. That putting your name up there might reduce the integrity of the wall. Instead, you’ll get a brick outside in the garden. I am so upset and I feel so helpless. 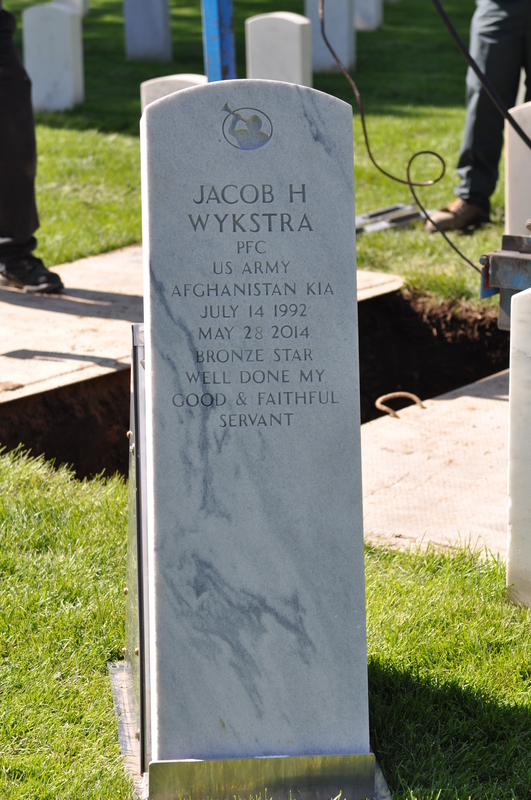 My son Jacob Henry Wykstra was killed in action 10 months ago in Maruf Afghanistan. He was selected from the infantry to be in a small medevac unit, trained to recover casualties and wounded soldiers from all NATO countries within the combat zones of Afghanistan. 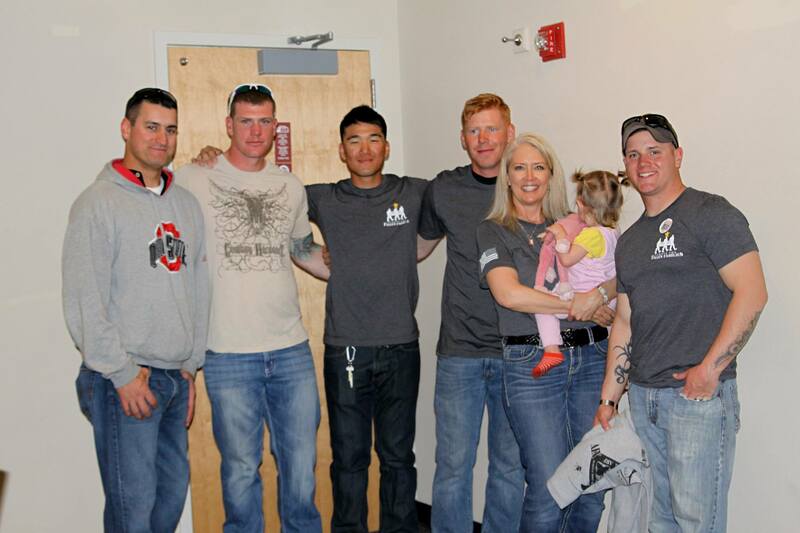 On May 28, 2014, Jake’s team was dispatched to recover Afghani casualties. Upon approach, the helicopter hit a dark communications tower and went down. There were 14 wounded and my son was the only casualty, as the Blackhawk landed on him crushing his body. Hello Mr. Forsythe, your question was forwarded to me from Tammy at the VMAC. Here is the background. First thank you for your interest in honoring Jake. We have been working with the Thornton Veterans Association who helps us identify those Adams 12 Students honored on the wall. When we opened the VMAC and put the wall in to honor Veterans it was determined that the wall would be reserved for those that have been designated KIA, MIA, DWRIA. The designation for Jake does not meet that requirement, however we will be honoring Jake with a brick in his name at the Memorial outside of the facility, there will be a ceremony later this Winter or early Spring. We have been in contact with the Wykstra family to ensure we honor their privacy and recognize their feelings in whatever we do. We will also be convening a group to discuss how we honor those Adams 12 Alumnae that have been killed or died during their service to the country, however did not meet the above designations. I believe we may end up with another wall with a plaque and name plates identifying those Adams 12 Alumnae that died during their service to their country. I hope this provides the information you were requesting. If you have further questions please feel free to contact me at the number below. 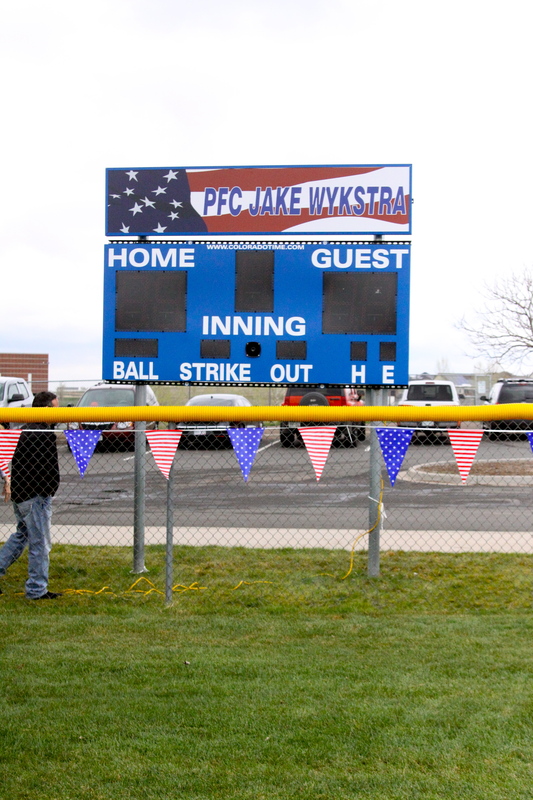 Thanks again for your interest in Honoring Jake Wykstra. 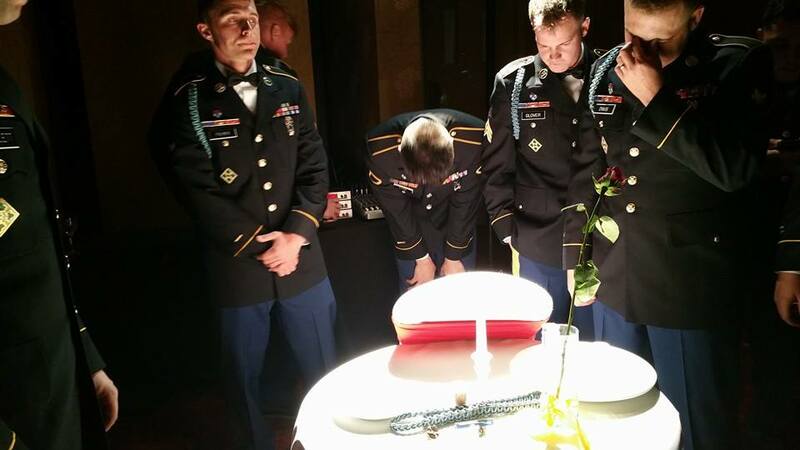 Jake was killed on May 28, at 11:38 p.m. when his platoon was assigned a mission to fly on a Blackhawk and medevac rescue a wounded International Security Force soldier. The Blackhawk crashed attempting to land at the medevac site. Seems pretty clear this is a combat mission? Please advise the Principle of Horizon and others at Adams 12 who are involved in this that our family would like to be included on any ceremony in which Jake is honored at the aquatics center. We appreciate your consideration and ask that you continue to help us honor and remember Jake. Thanks. Last question – who designates “the criteria” for this wall?? Is it you – is it the full board of the Thornton Veteran’s Memorial Foundation? The Mayor of Thornton and the full City Council have recognized Jake as a hero, and his sacrifice, so if the decision is to NOT include Jake on the fallen hero’s wall, we would like to appeal. Are you stating that in order to be on the “Fallen Hero’s Wall” inside the building, then he must be awarded the Purple Heart?? Jake has not been awarded the Purple Heart (yet – still in review by top brass – so we are told). He was clearly in a combat zone, on a combat mission, and we can provide other documentation to support that. Yes, we do have the engraved paver. The school district has been notified, waiting on the principal at Horizon high school to see how they want to proceed. As we have previously discussed, the criteria for the fallen heroes wall was established as death as result of enemy action and wounds suffered in combat, the individual being awarded a purple heart and declared killed in action (KIA) by the branch of service in which they were serving; and, a graduate of Adams 12 – 5 star schools. Mr. Weber – please see the below email exchange between myself and Mr. Branaugh. 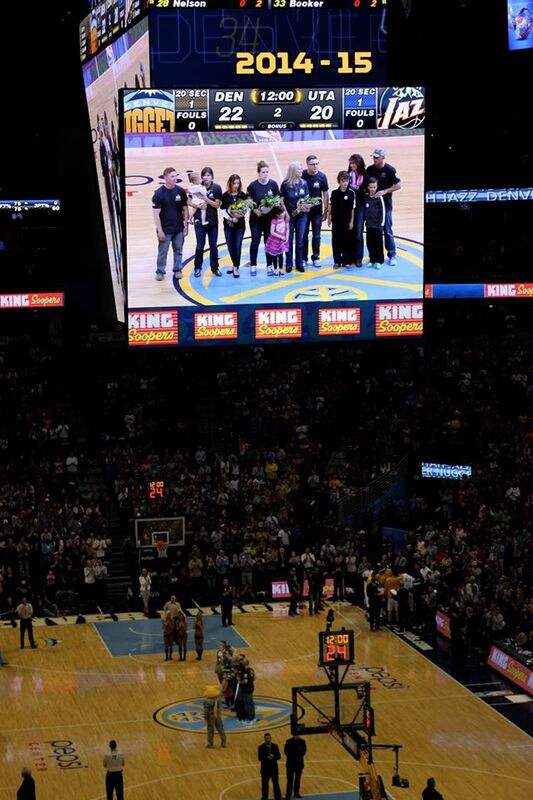 Again – we need clarification as to who sets the criteria for the heroes wall – and if the decision is to NOT include Jake, how we might appeal that. Jake was killed on a combat mission – not much else to say. The Fallen Heroes Wall of Honor is owned and maintained wholly by Adams 12 Five Star Schools. While the Thornton Veterans Memorial Foundation (TVMF) provided guidance into its creation and the criteria used for determining names attached to the memorial, we have no control over the actual display. We do assist Adams 12 in identifying potential candidates for the Wall of Honor. The City of Thornton is a non-party to the Wall of Honor and has nothing to do with it and never has. The Wall of Honor is located inside the Veterans Memorial Aquatics Center; the building and the property it sits on are owned by Adams 12. The information the DOD released regarding Jake’s loss said it occurred as a result of an “aircraft accident.” Contemporary news reports at that time indicated the same. To our knowledge, none of the reports pointed to hostile activity. Given those public facts and the lack of a Purple Heart award, Mr. Webber was correct in the assessment he provided back in January. A loss as a result of an “aircraft accident” in its most basic form would not meet the bar. I mentioned the Purple Heart because that is virtually always awarded to a Hostile Casualty. As I type this, I don’t know that I have ever heard of the Purple Heart not being awarded in those cases. The Purple Heart award has always been one of the requirements. Please know that it is not anyone’s goal to make this difficult for you and your families. The commentary and decision was based on the information available to TVMF and Adams 12 at the time. Obviously we all deeply value the service and sacrifice of all service members as is evidenced by the Thornton Veterans Memorial, the Veterans Memorial Aquatics Center and the Fallen Heroes Wall of Honor. Jake was very clearly an extraordinary young man and one worthy of admiration and every honor possible – there is no doubt about that. I am sure you can appreciate that it is simply everyone’s desire to keep the spirit and intent of the Wall of Honor intact. To do otherwise would dishonor those whose names are on it. If you have documentation to show Jake was a KIA / Hostile Casualty as defined by the DOD and a recipient of the Purple Heart, I am quite certain that Mr. Webber and Adams 12 would re-evaluate Jake for inclusion on the Wall of Honor. One more point – by your own email, the memorial inside the Aquatics center is called “Fallen Heroes Wall of Honor”. So this wall is reserved for Heroes – right? I appreciate your “criteria” and that those who are killed by “hostile action” are indeed heroes – I couldn’t agree more. I pray for their families. What about a soldier who is killed trying to save another soldier’s life in a medevac operation. Is that soldier a hero? What is offensive – is your recommended criteria that “hostile action” is a requirement – to qualify Jake for the “Heroes Wall”. And the further suggestion that including Jake on this wall therefore “would dishonor those whose names are on it” – is also offensive. Jake was in Afghanistan – at war – in a combat zone – was ordered by his Commanders to fly on a late-night mission to rescue other soldiers, had locked/loaded his weapon so he could establish a perimeter to secure the landing zone, by following the order of his Sergeant he had unbuckled his seat harness because they were 30 seconds from landing, and then the helicopter crashed while attempting to land – and he died on that mission. I’m sorry if you don’t consider that situation – those actions – worthy of a “hero” status. We do. Your letter is offensive to our family who has suffered a great loss. Your lack of compassion as a veteran is shocking. I recently spoke to a full-bird Army colonel who bluntly informed us that the Purple Heart is basically given to only those who are shot or blown-up. “Killed in Action” is NOT reserved for only these recipients. Those killed in action are troops deployed to a war zone and killed as a result of any combat situation, even accidents. 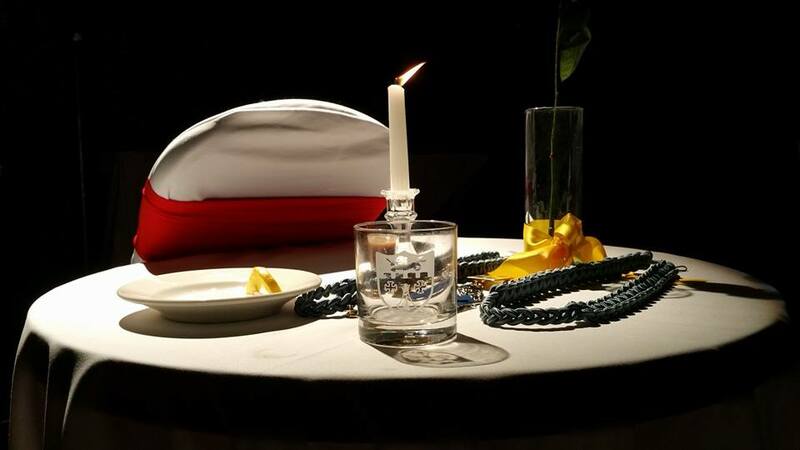 You are misinformed, or have not taken the time to learn the details of my son’s death. He was killed while on a combat mission when the medevac unit he belonged to was dispatched to recover Afghani casualties. During the mission, his helicopter crashed killing him and wounding 14 others. He was and always has been designated as KIA by everyone but you. Your letter infers that our son’s sacrifice is not worthy of a plaque on the VMAC. You state, “The DOD’s definition of Hostile Casualty states, “A person who is the victim of a terrorist activity or who becomes a casualty “in action.” “In action” characterizes the casualty as having been the direct result of hostile action, sustained in combat or relating thereto, or sustained going to or returning from a combat mission provided that the occurrence was directly related to hostile action.” If this is the case, then Jacob’s death meets the criteria. You are confusing the Purple Heart award with KIA. I apologize for my frustration, but your lack of understanding has caused our heart-torn family added grief, as it has only been 10 months since we lost our sweet son. I received kind and compassionate phone calls today from Tim Shaffer and Ron Webber; therefore I believe this will be rectified. Here are two of many websites that list Jacob as KIA. I can get more if needed. Tomorrow, Mr. Webber will receive information from the Department of the Army and I trust that he will take care of this. It seems this is where the information should have come from in the first place, rather than your personal and inaccurate understanding of the rule. It seems that the school district is relying on a small group of old veterans (The Thornton Veteran’s Association) from our small town to decide who is deserving to be on the “wall of honor” or if they should be on a brick outside of the building. 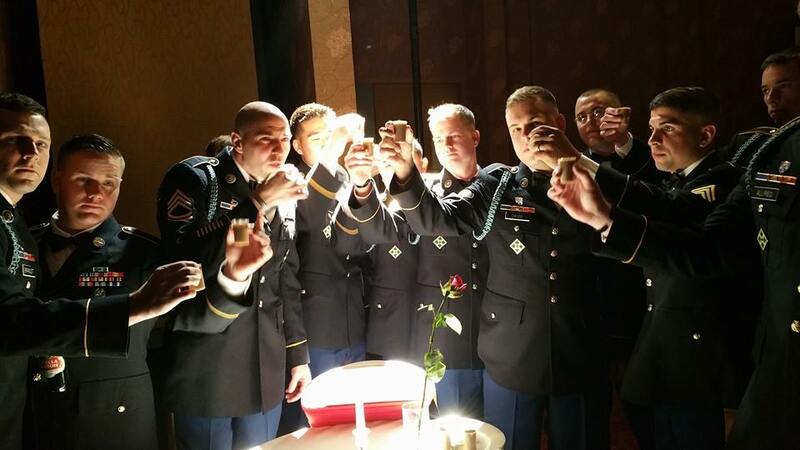 You have always been designated as KIA by everyone but these people. You belong on a plaque on the inside of the building because you made the ultimate sacrifice for freedom. I love you Jake and this will not end. You will be memorialized as you should be, and I will fight anyone to make sure this happens! Wow! What a fun night! I keep thinking that I wish you were there, but I am certain you were, since all of your favorite people attended to honor you! These things remind me how loved you are, and at the same time I’m feeling a bit of anxiety. My anxiety come because these celebrations will soon come to an end. What happens when they do? Will you be forgotten? Will people still remember and honor you? Logically, I know many of us will never forget that you lived and that your life improved ours. Emotionally, I worry because I am your mom and that’s my job. I remember the day I became a mother, your grandpa kissed me and said, “Congratulations. Now you get to worry for the rest of your life.” No truer words have been spoken, but I need to remember that I no longer have to worry about you. These adjustments in my role as your parent are so difficult to make. Not worry about you? My most precious child? We had many commanders and high rank come by to visit us, your nieces ran all over the suite and had such a great time, your buddies came by to meet us and to talk about you. The only thing missing was you. You will always be missed and loved so much! It’s been weeks since I’ve written. Time seems to fly by because so much is going on. We’re choosing plans for building our house and finding contractors, I am busy training the dogs, I spend time at the nursing home, my church callings keep me busy, and now I am volunteering at the VA hospital. Today “Max the wonder dog” came with me and the vets loved him. I was chatting with an older man (in a wheelchair and missing a leg) about you and as tears came down his face, he said, “Those boys in the Middle East have it so much worse than we did in Vietnam”. He asked if I was getting the support I needed, and he seemed to be more concerned concerned about me than himself. There are still such good people in this world. So, my schedule is full. I know that keeping busy in general helps me with my grief, but I have learned that serving others is the best way to honor you, my boy with the big heart. I have figured out that my burden is lifted when I help others who have similar or even very different problems. The pain of losing you never leaves my heart, but others can ease the hurt by allowing me to serve them. I am so grateful I have figured this out. I have lots of new relationships. I have met Gold Star mothers, new friends from church, and I love my 95 year-old friend in the nursing home. None of these people know you but they know about you. I sometimes feel that I talk about you too much and that it might drive people crazy, but I have to do it. Talking about you is how I keep you alive as an active part of my life. You’re still being honored left and right. We leave for Colorado in a couple of days where you’ll be honored at the Denver Nuggets game, and as soon as we return, we’ll be taking a road trip here in Iowa to be presented with a quilt by “Freedom Quilts”. 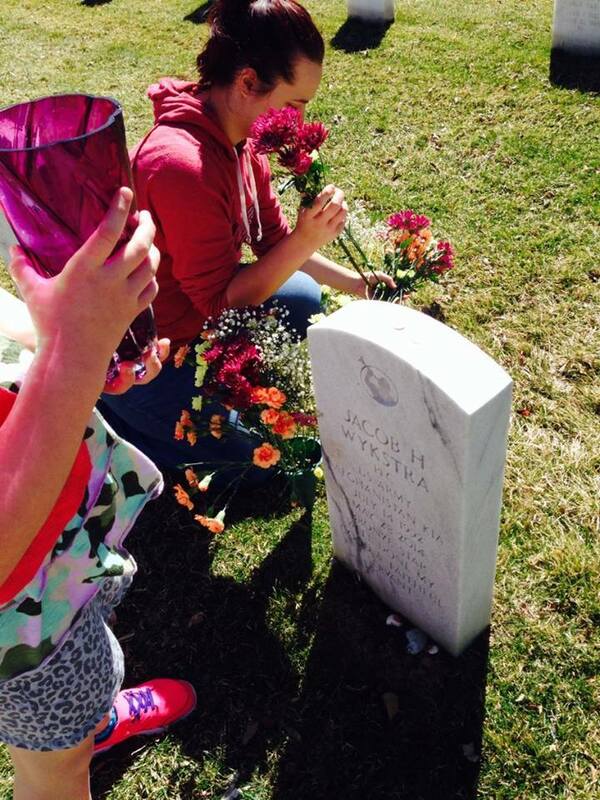 Friends have been visiting your grave for me, and even another Gold Star mom in Colorado (whom I’ve never met) brought you flowers because her son is buried at the same cemetery. You are not forgotten and never will be. Too many love you to let that happen. There’s an organization creating a bible for us, and within the bible they bind stories and pictures of you. I have spent so much time almost harassing people to write their stories about you. It’s too hard for your dad to share, but most everyone else in the family shared, as well as friends you grew up with and several of the soldiers you were deployed with. Reading each makes me cry because I miss you so much, but more because of the way you influenced others for good and because you are so loved. 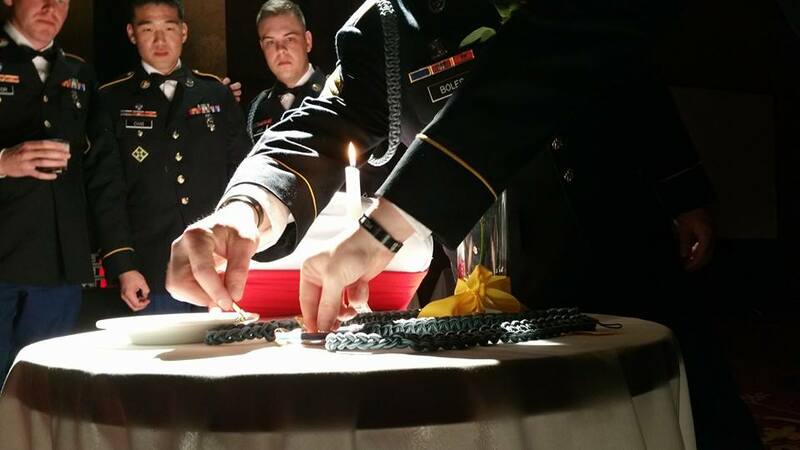 I have learned that God needs the good ones, because I have seen this trend as I’ve met other Gold Star families and learned of their children. Jake, I am so happy that you are one of the chosen, even if it brings me heart-wrenching pain. Your goodness continually makes me want to be a better person and I thank you for that. You will always be the bright light in my life, and even though I can’t see you, your presence cannot be eliminated; not even by death. I am always missing you, but I am trying to make the world a little bit better for those around me as a gift to you. I hope you know how hard I’m trying. I love you my precious boy. 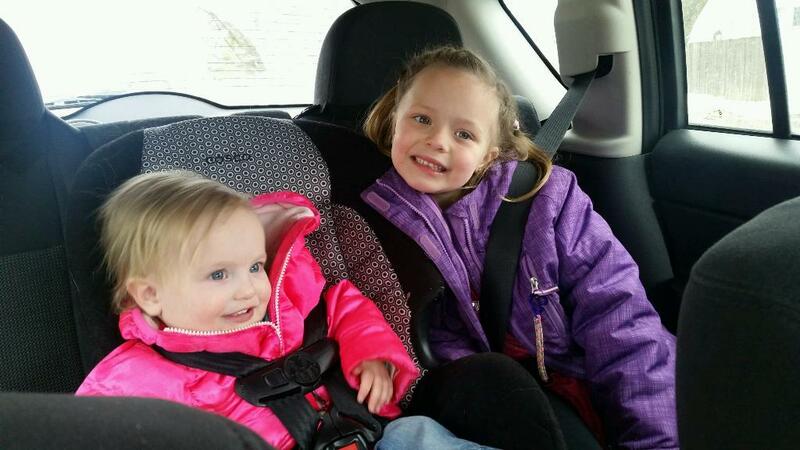 I had such a fun weekend with your sister and your two nieces. They bring me so much joy, but at the same time, I am reminded that I will never have you and your family visit me here in Iowa. The house has been taken over with toys and cereal everywhere and non-stop action. You were supposed to have a family and I was supposed to have more grandkids. Now, I only have your sister and her two girls, and I am boy-less. I don’t know if your sister will have any more children. You might always be my only boy. Your oldest niece is now five and in kindergarten. She realized that her younger sister (born while you were gone) will never have any memories of her uncle Jake. I told her that she’ll have to tell her baby sister all about you and how fun you were. She remembers her dates with you to Toys R Us and Chik-fil-a, and the time you took her to the movies to see “Frozen” just before you deployed. Jake, she talks about you every single day. I don’t think any of us will ever go a day without thinking of you. Grandpa’s visit overlapped with the girls’ time here. It was fun for all of us to be together. Grandpa isn’t one to talk about you, and when I bring you up he changes the subject. In the beginning it made me upset that he wouldn’t join me in verbally remembering you, but I know he does remember and I think it’s just hard for him. I’m sure he never thought he’d ever bury one of his grandkids. I’m still trying to keep myself busy. I’m working on my family history and helping others find their ancestors. I constantly think about you and wonder how many of ours that you have met. I wonder how you are helping in the afterlife. I know whatever you are doing, it is magnificent and I am so proud of you, Jake. You warm my heart every single day, and every day that same heart aches to see you, touch you and speak to you again. I have a friend who is also a Gold Star Mother. She sent me a message that her 32 year-old son was just diagnosed with cancer and has only 6 months to live. My heart has been breaking for her. She will outlive two sons. I am trying to help her find an apartment so that she can stay with him until he leaves this world. There is always someone out there with a struggle greater than mine, and this gives me an opportunity to love and support her the best I can. Our children aren’t supposed to leave us. Sometimes I shake my head and repeat, “I don’t understand” over and over again, but I think I do. It’s just too hard to accept. With all my heart, I love you, Jake. Please stay close to me so that I might feel your presence. This is one of my greatest desires. Some days I cry and some days I don’t, but I always miss you and I always hope and pray that you are happy. It’s interesting how God places people in our lives when we need them, and if we aren’t paying attention I think we miss it. My friendship with this sweet 95 year-old man has become one of the highlights of my week. We pick him up for church and I visit him a couple of times during the week. He never married and has no children, so he is literally alone. I think losing you and moving to a new state at the same time has made me more aware of loneliness, and allows me to see it more easily in others; a new ability I think. I do all of the normal things, like worry about him, bring him treats, share my adventures and sometimes read with him. He recently got a new roommate named Bob who is an Army veteran and cannot speak. When I saw his “Veteran” sign, I asked him if he was in the Army and he smiled and nodded. I told him all about you and a tear rolled down his cheek as he listened to me describe what a hero you are. He has a photo button of you in uniform on a bulletin board right by his head so he can see you every day. I can tell he loves it by his expression. He too warms my heart and allows me to shine the love I have for you on him. On Saturday, several of the moms I’ve gotten to know are starting a new Gold Star Mom chapter in Iowa. I guess there hasn’t been one here since 1949. Other than service, nothing brings me more comfort than other Gold Star parents. Just being around them brings a peace that I cannot articulate. I hate that any of us belong to this group, but at the same time I am so grateful that we are here for one another. Today I was finger-printed at the VA Hospital as part of a back-ground check. I’ll be volunteering in any way I can to help your brothers and sisters. I have been in touch with the 14 that were wounded in the helicopter crash with you. It’s quite incredibl;e that you were the only death. Your lieutenant is still an inpatient after more than 8 months and another just had surgery on both knees again yesterday! My heart breaks for these men because they are tied to you and I know how much you loved them. If I can love any of them back, I will. Max will sometimes go with me to the hospital when a therapy dog is needed. He has a little camo vest. You would love it! I think he’ll enjoy spending time with the vets and I pray he’ll bring them some comfort and healing. He’s such a good boy! I am so grateful for these opportunities to love others and the way it benefits my own healing. I am certain we’re meant to love one another through this difficult life, and I have learned that service benefits the giver more than the recipient. I already know you know this. I know how big your heart is and I am more proud of you as each day passes. I am learning the truth to “only the good die young”. You are truly a good soul. I love you so much, Jake and every day I dream of the day I will see your beautiful face again! 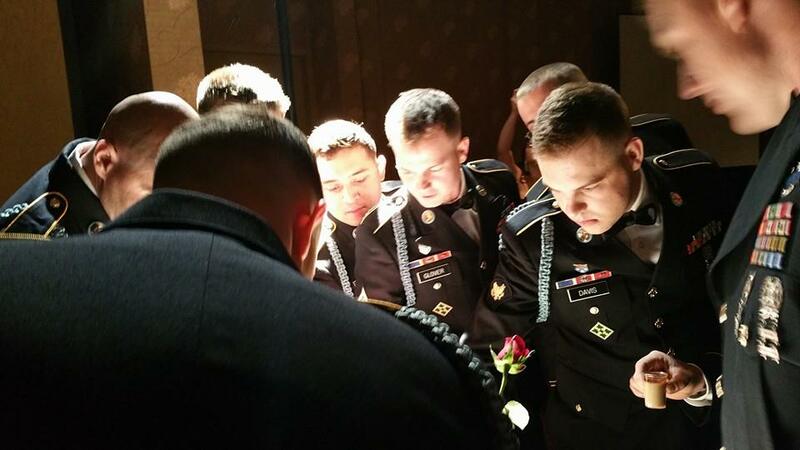 The Army Ball was last night, and as they celebrated, I knew one was missing. My heart ached to think that he couldn’t be there with his brothers, but then I saw the pictures of these now familiar faces and the tears began and I am sobbing as I write. Of course they didn’t forget my boy. They love him and will always remember him. He is a hero for all of us, and he is my hero too, but more than that, he is my baby, my little boy, my goofy teen-ager and my big-hearted man. Jake, you will live in our memories until we see you again. You are so loved! It’s hard to believe that almost a month has passed since I last wrote. Two weeks of this time away was due to eye surgery, but it also seems that I don’t need to use writing as therapy as much. I have tears every day, but they are less consuming and more fleeting. I saw a quote yesterday that sums the past seven plus months, “Grief is like the ocean, it comes on waves ebbing and flowing. Sometimes the water is calm and sometimes it is overwhelming. All we can do is learn to swim”. I can’t say I have yet learned to swim, but I am more comfortable in the water. My days are still filled with thoughts and memories of Jake. He never leaves me and I am learning to smile as I remember how fun it was to raise him. Earlier in my grieving, these memories only reminded me that there will be no more new moments to retain, but now I can smile and sometimes smile and cry at the same time. This is a new experience for me. 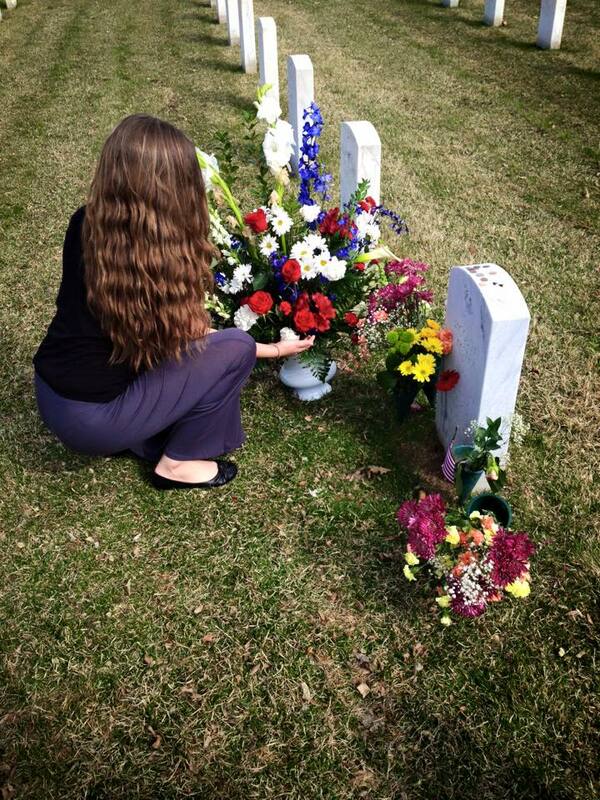 But, occasions remain when the heartache becomes so overwhelming; as if I lost him just yesterday. I cry until my tears dry up and the tissues are gone, and then I remember how much Jake loves me and wants happiness for me. It was always this way. He believed his purpose in life was to raise the spirits of those around him, and he excelled in this calling. He was blessed with a desire to love others and a good sense of humor. This is the combination I miss the most. Someone told me the other day that Jake is with me more now than he was when he was here in this life. I believe that the spirit world is all around us, so it must be true. I know he couldn’t be in a paradisical state without the ability to be near those he loves or it wouldn’t be paradise. I pray to dream of him and I pray to feel him near me. Sometimes his presence is so strong and at other times no matter how hard I try, it seems he’s not there. His coming to me is determined by something I don’t understand, because I cannot will him to come. I am grateful for the sense that he is with me and will continue to pray for these miraculous events. 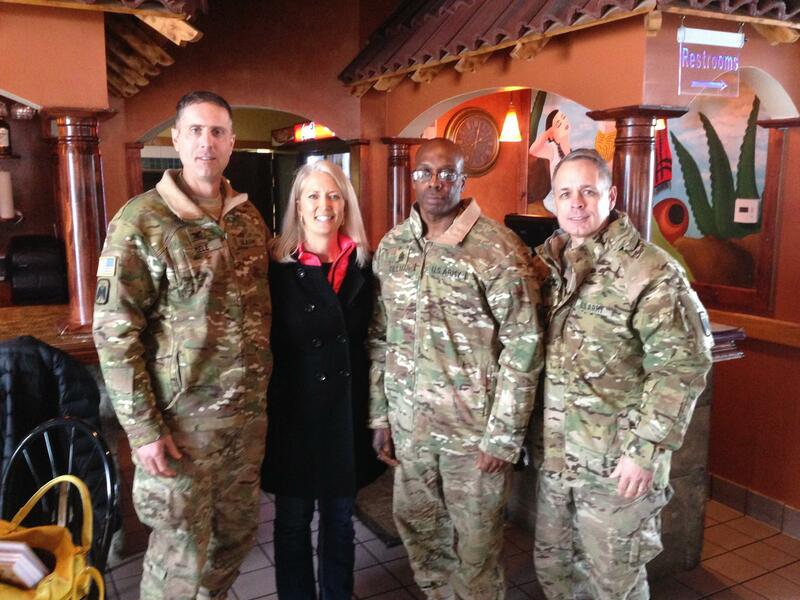 Earlier this month, I had lunch with the Commander and two others from the 16th Combat Aviation Brigade that were deployed with Jake. They happened to be here at Camp Dodge for a yellow ribbon ceremony and contacted me. They were over the pilots flying the night Jake was killed. I appreciated the genuine concern they had for me and for my family, and I had the opportunity to talk about my boy for almost two hours. It’s always a good day when I can share my boy! I learned from them that the helicopter did not spin as it was descending but rather made a nosedive, flipping over on its back. Flipping over on top of Jake. I wonder how much information is out there that I can’t obtain because people hesitate to talk to me about Jake’s death. I wish I could tell the world that I want to know everything that happened to him, and that talking about Jake keeps him alive for me. My sweet son, The one year anniversary of our last moment together has just passed. 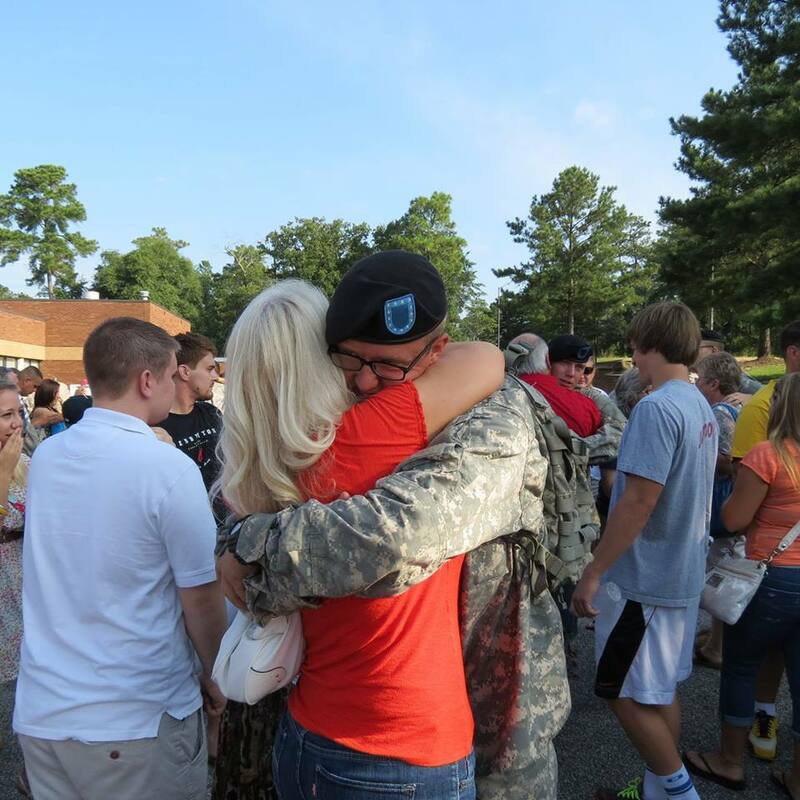 On January 23rd one year ago, I woke up early to cook for you one last time before you left for Afghanistan. It was snowing outside and you were worried about getting to Fort Carson on time in the snow. But I made you stop for a moment, to take one last picture with me and to hug me. You first gave me a quick hug, but I made you stop, I looked in to your blue eyes and asked for a real hug. Neither of us knew that this would be our last moment together in this life. Jake, my life will never be the same without you, but how grateful I am for every minute I got to be your mom, and how proud I am for your service to others and for what you were able to accomplish in your short 21 years on the Earth. You influenced so many people and you will never be forgotten. You will always be my sunshine and my love for you is endless. Thank you for being you. January 2nd was the day I was looking forward to and today is that day. No more holidays to struggle through and no more painful thoughts of what I was missing without you. I have started a new year without you whether I like it or not, and guess what? I’m doing okay. I have realized how happy I am to leave 2014 behind. The memories of you will always be in my heart, but I am happy to say goodbye to the heartache and the difficulties that came with losing you. This feels like a new beginning, and I will try to embrace it and find happiness during this new year. I know you want that for me and I know that with the help of my Father in Heaven, I will smile more and cry less as time goes on. You inspire me to live a good life and I will try, Jake. I will try to accomplish good things with the time I have in this life and I will pray that you’ll be by my side. I have frequently prayed to dream about you and you have come to me several times. It feels like such a gift because you are alive. It’s kind of funny that when you were alive and in my dreams, you were always at your currant age. Now, when I dream about you, you come to me at different ages. Sometimes you’re a small child and sometimes a teenager and sometimes an adult, as you were when I saw you last. There is no explanation except that these are blessings from a loving Father in Heaven allowing me to know that you are alive and with me. I am so grateful for this knowledge! I want you to know that I’m doing okay. Sometimes I still cry over my unfathomable loss, sometimes my eyes well-up with reminders of you, but overall I am learning to exist in a world without you. Of course my world will never be complete, but I will exist with the knowledge that I will see you one day. I can’t wait to hug you again!